Our fabulous guests! 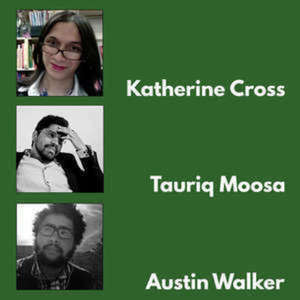 Katherine Cross, our dapper scholastic games critiquer extraordinaire whose work appears in Feministing and Gamasutra, next we have Tauriq Moosa, who loves the Witcher 3 while giving it a critical side eye, is wicked smart and writes for Polygon, Guardian, Daily Beast, Mary Sue, an and quite a few other places. Last but certainly not least, we have Austin Walker, who recently joined Giant Bomb, congrats on the newish gig! Apologies in advance for some audio issues. Technology turned on us mid-recording so there's been some editorial finagling done to bring you this episode.